Cars Toon Monster Truck Wrastlin' Ring: Ready for the main event? 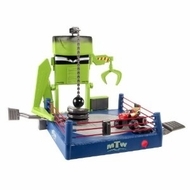 The final showdown in the Cars Toon, "Monster Truck Mater," can be relived again and again with this wrestling ring that features a spinning floor, a "claw" for scooping up your opponents, and a lever for great flipping action. The ultimate pay-off? Defeating the monster of course! Here's your chance to show your friends who's really king of the ring! Made to work with monster trucks from the Cars Toon Deluxe Vehicles Assortment. Kids recreate the final showdown in the Cars Toon, "Monster Truck Mater"
Here's your chance to show your friends who's really king of the ring!